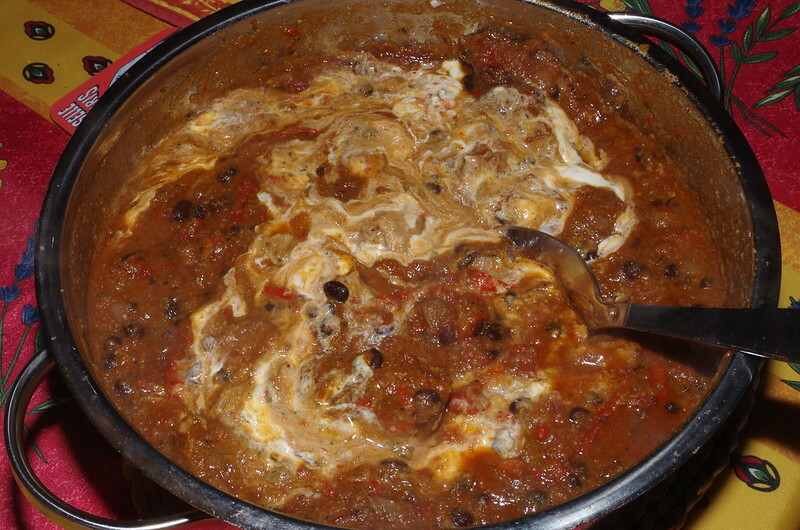 Tex-Mex pork and black bean stew. Well, courtesy of Thomasina Miers excellent book, Mexican Food Made Simple actually. 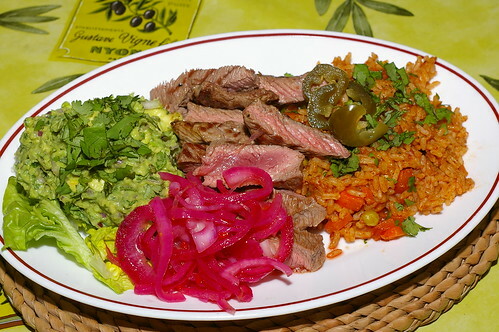 I saw this on the C5 TV series Mexican Food Made Simple with Thomasina Miers. I expect that the recipe is in her book of the same name, but I don’t own it (yet!). 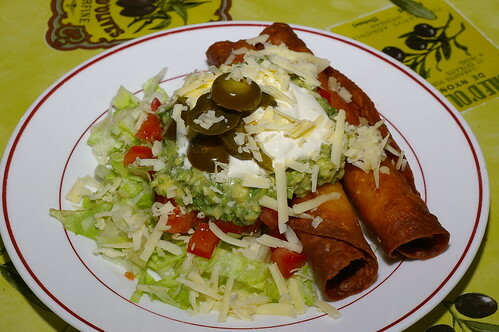 From the TV show, the tacos are made with corn tortillas filled with poached chicken and tightly rolled, secured with cocktail sticks and then deep-fried until thick. So, I poached a couple of chicken breasts in water, with a carrot, half an onion, a couple of bay leaves, some parsley stalks and a dried chipotle chilli. When the chicken was cooked, I let it cool and then shredded it before rolling it up in the tortillas. Once fried, I served them with sour cream, guacamole, pickled jalapeños, grated cheese and a salad of lettuce and diced tomato. This was basically a Mexican-influenced meal. The chicken was cubed breast meat, cooked in olive oil with shallots, red peppers, garlic, green and yellow chillies and tomatoes with a splash of red wine vinegar, some recado de achiote powder, salt and pepper and garnished with chopped green coriander. 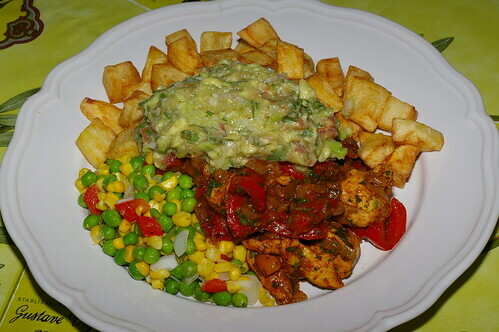 The accompaniments were some cubes of potato, deep-fried and lightly salted, guacamole and some fresh shelled peas and sweetcorn, just blanched and drained and finished off in butter with some chopped salad onion and finely diced red pepper. To drink we had a mature Spanish red wine, Ramon Roqueta ‘Los Condes’ Gran Reserva from Laithwaites. They are currently listing the 2003, but we had the 2001 vintage because we had bought it as part of a mixed case a couple of years ago. It was a deep wine, pure Tempranillo and with a nice long finish and good soft tannins from the time it had spent in oak. I had two chunky pork shoulder steaks and I marinated them in a Mexican-style sauce. The sauce was made from some soaked dried chillies (Guajillo, Pasilla and Chipotle), an onion, a couple of cloves of garlic, the juice of a lime, a splash of sherry vinegar and a squeeze of runny honey, all blitzed in a blender with the soaking liquid. After a few hours in the fridge, I baked the pork steaks in the oven, with some foil over the dish at first, until they were tender. When they were done, I reduced down the sauce in a small saucepan and adjusted the seasoning. The sauce was spooned over the pork. 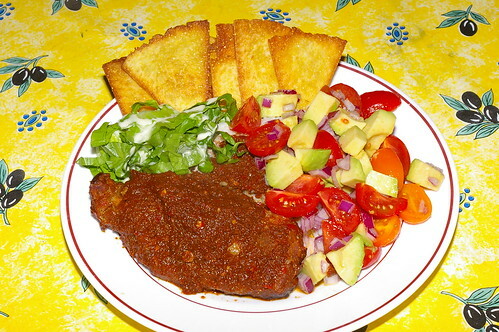 To accompany this there was plain white rice, some home=made tortilla chips, an avocado and tomato salad and some crisp Romaine lettuce with a simple dressing of lime juice, Dijon mustard and olive oil. To drink, we had a bottle of Maipo Gran Reserva Shiraz from Chile. This is currently on a Two bottles for £10 deal at Sainsburys. It is a decent bottle, nice rich plummy fruits and a soft, mouth-filling spiciness but I wouldn’t really say that it was worth the alleged pre-offer price of £10.99 a bottle. At a fiver a go, it is definitely worth the money and it would work pretty well with any Mexican meal or with a barbecue. 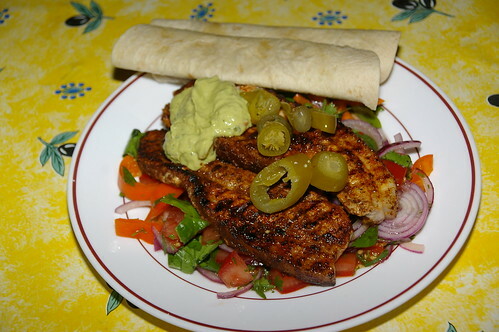 Mexican-spiced pork belly, a photo by La belle dame sans souci on Flickr. I used belly pork “rashers” for this and they were rubbed with a mixture of chipotle chilli powder and a spice blend called Recado de Achiote (made from ground annatto seed, sea salt, garlic powder, ground cumin, ground allspice, Mexican Oregano) from the Cool Chile Co, plus some lime juice and olive oil. These were just griddled and served with a salad of lettuce, tomatoes, red onions, coriander leaves and sweet orange peppers in a lime and olive oil dressing. I also served some wheat flour tortillas, some guacamole (bought as all the avocados in the shops were rock hard yesterday) and some picked jalapeños. I wanted to make a whole pie, rather than empanadas, so what I did was line a deep pie dish with a removable bottom with shortcrust pastry and filled it with a mixture of chicken breasts, cubed and cooked off with onions, garlic, green chilli, chopped coriander, red and green peppers, salt, pepper, chipotle paste and halved baby plum tomatoes, then topped the filling off with grated Cheddar cheese and cream and then topped the pie with a pastry top. This was egg-washed and baked in a Gas Mark 6 oven for around 45-50 minutes. 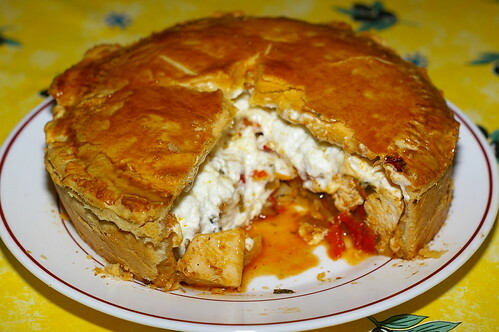 We had a simple salad with the pie and a bottle of Torres Gran Sangre de Toro to drink, a rich wine that worked well with the spicy, rich pie. Torres wines are always reliable, one of the best international brands and the wines are widely available in the UK.